You can use the Stereo Camera Calibrator app to calibrate a stereo camera, which you can then use to recover depth from images. A stereo system consists of two cameras: camera 1 and camera 2. The app can either estimate or import the parameters of individual cameras. The app also calculates the position and orientation of camera 2, relative to camera 1. Rectify stereo images using the rectifyStereoImages function. Reconstruct the 3-D scene using the reconstructScene function. Compute 3-D locations corresponding to matching pairs of image points using the triangulate function. The suite of calibration functions used by the Stereo Camera Calibrator app provide the workflow for stereo system calibration. You can use these functions directly in the MATLAB® workspace. For a list of calibration functions, see Single and Stereo Camera Calibration. You can use the Camera Calibrator app with cameras up to a field of view (FOV) of 95 degrees. Prepare images, camera, and calibration pattern. Adjust parameters to improve accuracy (if necessary). In some cases, the default values work well, and you do not need to make any improvements before exporting parameters. You can also make improvements using the camera calibration functions directly in the MATLAB workspace. For a list of functions, see Single and Stereo Camera Calibration. MATLAB Toolstrip: On the Apps tab, in the Image Processing and Computer Vision section, click the Stereo Camera Calibrator icon. To improve the results, use between 10 and 20 images of the calibration pattern. The calibrator requires at least three images. Use uncompressed images or lossless compression formats such as PNG. The calibration pattern and the camera setup must satisfy a set of requirements to work with the calibrator. For greater calibration accuracy, follow these instructions for preparing the pattern, setting up the camera, and capturing the images. The Camera Calibrator app uses a checkerboard pattern. A checkerboard pattern is a convenient calibration target. If you want to use a different pattern to extract key points, you can use the camera calibration MATLAB functions directly. See Single and Stereo Camera Calibration for the list of functions. You can print (from MATLAB) and use the checkerboard pattern provided. The checkerboard pattern you use must not be square. One side must contain an even number of squares and the other side must contain an odd number of squares. Therefore, the pattern contains two black corners along one side and two white corners on the opposite side. This criteria enables the app to determine the orientation of the pattern. The calibrator assigns the longer side to be the x-direction. Attach the checkerboard printout to a flat surface. Imperfections on the surface can affect the accuracy of the calibration. Measure one side of the checkerboard square. You need this measurement for calibration. The size of the squares can vary depending on printer settings. To improve the detection speed, set up the pattern with as little background clutter as possible. Keep the pattern in focus, but do not use autofocus. If you change zoom settings between images, the focal length changes. Capture the images of the pattern at a distance roughly equal to the distance from your camera to the objects of interest. For example, if you plan to measure objects from 2 meters, keep your pattern approximately 2 meters from the camera. Place the checkerboard at an angle less than 45 degrees relative to the camera plane. Do not modify the images, (for example, do not crop them). Do not use autofocus or change the zoom settings between images. Capture the images of a checkerboard pattern at different orientations relative to the camera. Capture a variety of images of the pattern so that you have accounted for as much of the image frame as possible. Lens distortion increases radially from the center of the image and sometimes is not uniform across the image frame. To capture this lens distortion, the pattern must appear close to the edges of the captured images. Make sure the checkerboard pattern is fully visible in both images of each stereo pair. Keep the pattern stationary for each image pair. Any motion of the pattern between taking image 1 and image 2 of the pair negatively affects the calibration. Create a stereo display, or anaglyph, by positioning the two cameras approximately 55 mm apart. This distance represents the average distance between human eyes. For greater reconstruction accuracy at longer distances, position your cameras farther apart. 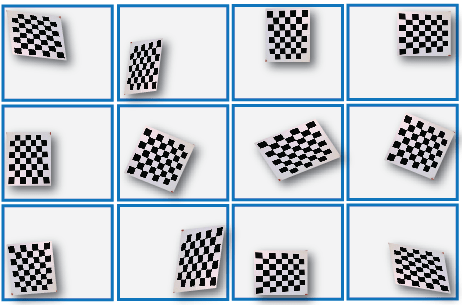 To begin calibration, click , specifically two sets of stereo images of the checkerboard,one set from each camera. You can add images from multiple folders by clicking Add images in the File section of the Calibration tab. Select the location for the images corresponding to camera 1 using the Browse button, then do the same for camera 2. Specify Size of checkerboard square by entering the length of one side of a square from the checkerboard pattern. The calibrator attempts to detect a checkerboard in each of the added images, displaying an Analyzing Images progress bar window, indicating detection progress. If any of the images are rejected, the Detection Results dialog box appears, which contains diagnostic information. The results indicate how many total images were processed, and of those processed, how many were accepted, rejected, or skipped. The calibrator skips duplicate images. To view the rejected images, click View images. The calibrator rejects duplicate images. It also rejects images where the entire checkerboard could not be detected. Possible reasons for no detection are a blurry image or an extreme angle of the pattern. Detection takes longer with larger images and with patterns that contain a large number of squares. The Data Browser pane displays a list of image pairs with IDs. These image pairs contain a detected pattern. To view an image, select it from the Data Browser pane. The Image pane displays the selected checkerboard image pair with green circles to indicate detected points. You can verify that the corners were detected correctly using the zoom controls. The yellow square indicates the (0,0) origin. The X and Y arrows indicate the checkerboard axes orientation. You can choose for the app to compute camera intrinsics or you can load pre-computed fixed intrinsics. To load intrinsics into the app, select Use Fixed Intrinsics in the Intrinsics section of the Calibration tab. The Radial Distortion and Compute options in the Options section are disabled when you load intrinsics. To load intrinsics as variables from your workspace, click Load Intrinsics. For example, if the wideBaselineStereo struct contains the intrinsics for both cameras. Then, click Load Intrinsics to specify these variables in the dialog box, as shown. Once you are satisfied with the accepted image pairs, click the Calibrate button on the Calibration tab. The default calibration settings assume the minimum set of camera parameters. Start by running the calibration with the default settings. After evaluating the results, you can try to improve calibration accuracy by adjusting the settings and adding or removing images, and then calibrate again. When the camera has severe lens distortion, the app can fail to compute the initial values for the camera intrinsics. If you have the manufacturer’s specifications for your camera and know the pixel size, focal length, or lens characteristics, you can manually set initial guesses for camera intrinsics and radial distortion. To set initial guesses, click Options > Optimization Options. These options are not available for preloaded intrinsics. Select the top checkbox and then enter a 3-by-3 matrix to specify initial intrinsics. If you do not specify an initial guess, the function computes the initial intrinsic matrix using linear least squares. Select the bottom checkbox and then enter a 2- or 3-element vector to specify the initial radial distortion. If you do not provide a value, the function uses 0 as the initial value for all the coefficients. You can evaluate calibration accuracy by examining the reprojection errors, examining the camera extrinsics, or viewing the undistorted image. For best calibration results, use all three methods of evaluation. The reprojection errors are the distances, in pixels, between the detected and the reprojected points. 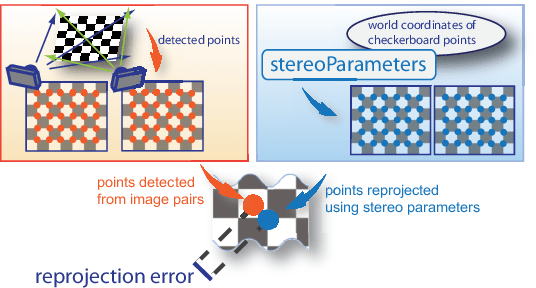 The Stereo Camera Calibrator app calculates reprojection errors by projecting the checkerboard points from world coordinates, defined by the checkerboard, into image coordinates. The app then compares the reprojected points to the corresponding detected points. As a general rule, mean reprojection errors of less than one pixel are acceptable. The Stereo Calibration App displays, in pixels, the reprojection errors as a bar graph. The graph helps you to identify which images that adversely contribute to the calibration. Select the bar graph entry and remove the image from the list of images in the Data Browser pane. 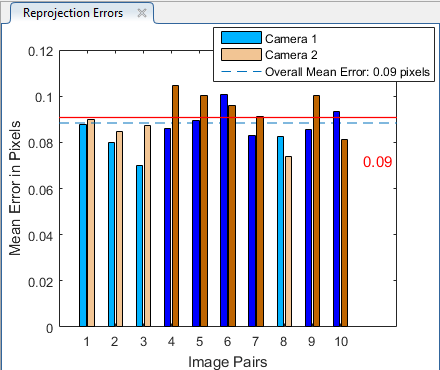 The bar graph displays the mean reprojection error per image, along with the overall mean error. The bar labels correspond to the image IDs. The highlighted bars correspond to the selected image pair. Clicking the corresponding bar in the graph. Select the image pair from the list in the Data Browser pane. Adjust the overall mean error. Click and slide the red line up or down to select outlier images. 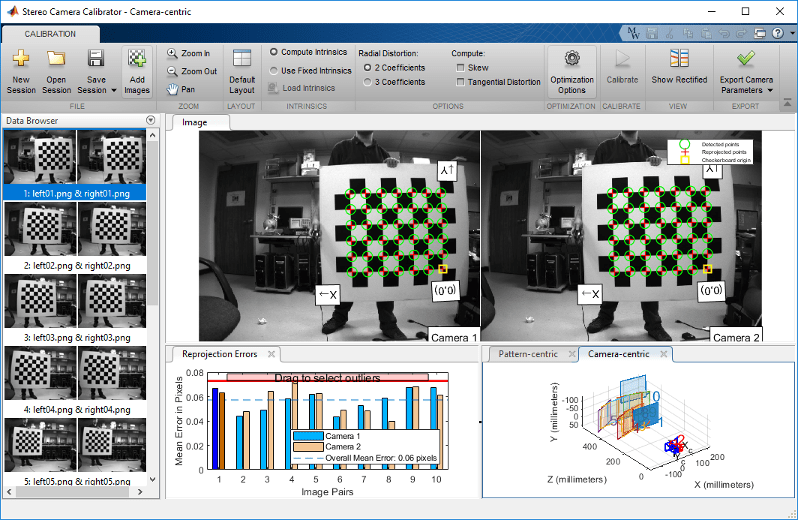 The 3-D extrinsic parameters plot provides a camera-centric view of the patterns and a pattern-centric view of the camera. The camera-centric view is helpful if the camera was stationary when the images were captured. The pattern-centric view is helpful if the pattern was stationary. You can click the cursor and hold down the mouse button with the rotate icon to rotate the figure. Click a checkerboard (or camera) to select it. The highlighted data in the visualizations correspond to the selected image in the list. Examine the relative positions of the pattern and the camera to determine if they match what you expect. For example, a pattern that appears behind the camera indicates a calibration error. To view the effects of stereo rectification, click Show Rectified in the View section of the Calibration tab. If the calibration was accurate, the images become undistorted and row-aligned. Checking the rectified images is important even if the reprojection errors are low. For example, if the pattern covers only a small percentage of the image, the distortion estimation might be incorrect, even though the calibration resulted in few reprojection errors.The following image shows an example of this type of incorrect estimation for a single camera calibration. To improve the calibration, you can remove high-error image pairs, add more image pairs, or modify the calibrator settings. You have less than 10 images. The patterns do not cover enough of the image frame. The patterns do not have enough variation in orientation with respect to the camera. The images have a high mean reprojection error. The images contain a checkerboard at an angle greater than 45 degrees relative to the camera plane. The images contain incorrectly detected checkerboard points. You can specify 2 or 3 radial distortion coefficients by selecting the corresponding radio button from the Options section. Radial distortion occurs when light rays bend more near the edges of a lens than they do at its optical center. The smaller the lens, the greater the distortion. x, y — Undistorted pixel locations. x and y are in normalized image coordinates. Normalized image coordinates are calculated from pixel coordinates by translating to the optical center and dividing by the focal length in pixels. Thus, x and y are dimensionless. k1, k2, and k3 — Radial distortion coefficients of the lens. Typically, two coefficients are sufficient for calibration. For severe distortion, such as in wide-angle lenses, you can select 3 coefficients to include k3. When you select the Compute Skew check box, the calibrator estimates the image axes skew. Some camera sensors contain imperfections that cause the x- and y-axes of the image to not be perpendicular. You can model this defect using a skew parameter. If you do not select the check box, the image axes are assumed to be perpendicular, which is the case for most modern cameras. Tangential distortion occurs when the lens and the image plane are not parallel. The tangential distortion coefficients model this type of distortion. 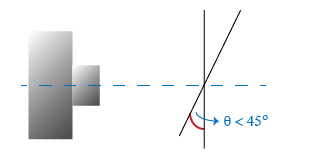 p1 and p2 — Tangential distortion coefficients of the lens. When you select the Compute Tangential Distortion check box, the calibrator estimates the tangential distortion coefficients. Otherwise, the calibrator sets the tangential distortion coefficients to zero. When you are satisfied with calibration accuracy, click Export Camera Parameters. 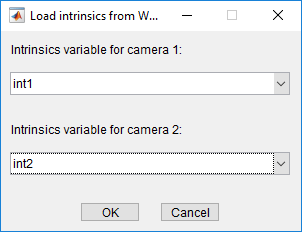 You can either save and export the camera parameters to an object by selecting Export Camera Parameters or generate the camera parameters as a MATLAB script. Select Export Camera Parameters > Export Parameters to Workspace to create a stereoParameters object in your workspace. The object contains the intrinsic and extrinsic parameters of the camera and the distortion coefficients. You can use this object for various computer vision tasks, such as image undistortion, measuring planar objects, and 3-D reconstruction. See Measuring Planar Objects with a Calibrated Camera. You can optionally export the stereoCalibrationErrors object, which contains the standard errors of estimated stereo camera parameters, by selecting the Export estimation errors check box. 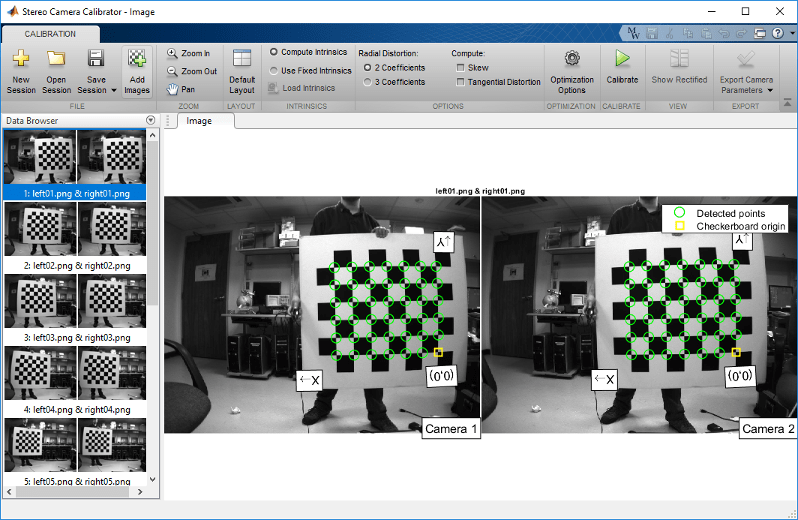 Select Export Camera Parameters > Generate MATLAB script to save your camera parameters to a MATLAB script, enabling you to reproduce the steps from your calibration session. Zhang, Z. “A Flexible New Technique for Camera Calibration”. IEEE Transactions on Pattern Analysis and Machine Intelligence.Vol. 22, No. 11, 2000, pp. 1330–1334. Heikkila, J, and O. Silven. “A Four-step Camera Calibration Procedure with Implicit Image Correction.” IEEE International Conference on Computer Vision and Pattern Recognition. 1997.